Ted Drewes – almost as historic to St. Louis as the Cardinals. Serving St. Louis since 1930. Ballpark Village is the first sports anchored entertainment district facility every. It offers valet parking or self parking, 7 days a week. 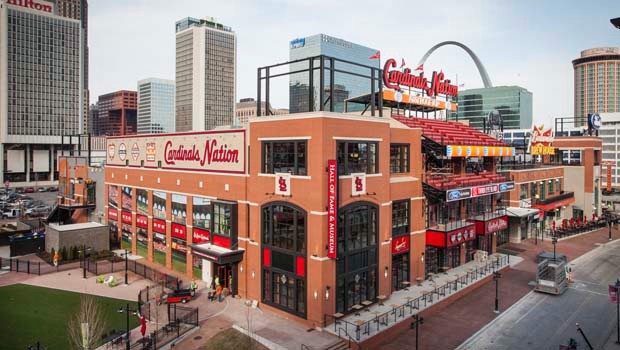 Ballpark Village is located on the north side of Busch Stadium, home to the St. Louis Cardinals at 601 Clark Avenue, St. Louis, MO. Ballpark Village has events almost daily. If you are planning on visiting, it would be a good idea to check their Entertainment Schedule to see if anything is of interest to you. They frequently host concerts, festivals, family events, game watch parties and much, much more. There is no doubt that this is the biggest project to hit St. Louis in a long time. At an estimated 650 million dollars, it should be, but the traffic that this attraction is attracting is over the edge. They have it all, food, drinks, entertainment, sufficient parking, valet parking and the most important item; the Cardinals. Ballpark Village’s website has some great pictures for your viewing pleasure.